Salmon is one of the healthiest and most filling fish you can make -- full of protein, omega-3 fatty acids, and vitaimin D, salmon is a geat choice for a health concious family. Our version from Norway is big on flavor and low on fat, so it's perfect for those days when you want to eat light but still feel full! Baked salmon with herbs and potatoes. Photo courtesy of SOS Norway. Preheat oven to 350 degrees F (180 degrees C). 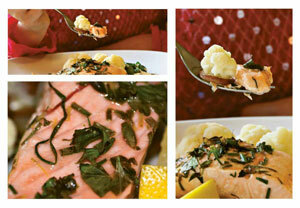 Divide the salmon filet into four equal pieces. Add the water and the salt to a large bowl and add the salmon [this will brine the salmon and lock in its flavor], letting it sit for about 10 minutes. Meanwhile, mix the herbs and the lemon peel in a small bowl. Cut the butter in with the herbs until the herbs are evenly distributed throughout the butter. Remove the salmon from the salt water, rinse and dry them well. Place the salmon on a baking sheet lined with parchment paper, skin side down. Spread the butter-herb mixture over the top of the salmon and bake for about 8 minutes [or until the salmon is cooked through].